where natural substances known as enzymes will transform how we view -- and combat -- disease. Unlike conventional medications, which only mask symptoms, enzyme supplements work at the cellular level to repair and prevent the damage that's responsible for a host of health problems. And they're safe, with no known side effects. 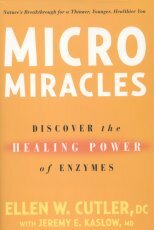 In MicroMiracles, you'll also discover how undiagnosed food intolerances may leave you feeling less than your best -- and how enzymes support optimum digestion and restore balance to all of your body's systems. Your payoff is radiant health.